I’ve been thinking about summer a lot lately. With all of this rain that has been pounding the San Francisco Bay Area, it’s hard not to want to sneak away to try to find a little slice of sun somewhere. Even when the clouds momentarily part (as they finally did today), there is still this whole other aspect of winter that I’ve grown tired of: the food. It’s getting hard to get excited about eating any more kale, potatoes, and apples. I’m still digging the citrus, but even oranges are starting to feel a little too routine. I was talking to a friend recently about how easy it used to be to get away. We’d plan a trip in a matter of days, taking advantage of our newly-found freedom as working city girls. We were unattached, we were unconsumed, we weren’t working on the weekends, and everything just seemed…easier. When I first started working, I actually felt a sense of new-found freedom: even a humble salary made me feel powerfully free to spend money in a way I never felt I could while I was in school. It’s hard to pinpoint exactly what changed in the last five years, but coordinating a getaway – even when it’s just with my husband – seems to be a much bigger commitment these days than it ever was before. Our spending power has gone up, as we’ve progressed in our careers and created a more stable life, but our free time has virtually disappeared. It feels like it’s just a fact of life: the older you get, the less time you have to putz around. And sometimes, I kind of miss putzing around. It makes me long for summer days – days when you can ‘get away’ in your own backyard, if you need to. There’s something about the sun, the longer days, the smell of grass and flowers, sliced peaches and lemonade that can instantly take you on vacation – even if a real vacation is a ways away. This soup, although it is homey, cozy and warm, reminds me of those last days of early spring that just begin to open the curtain to a long summer ahead. 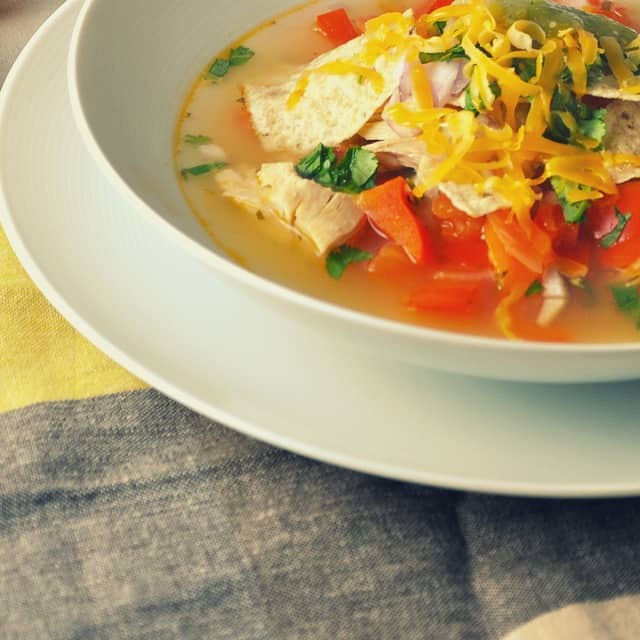 With its citrus punch, spicy kick, vibrant colors and textures, Tortilla Soup is the just the thing to transport you to a new season. If you’ve never made Tomatillo salsa at home, I would highly encourage that you make it for this soup. The recipe makes plenty for scooping up with tortilla chips before a party, too. 1. Prepare the broth: place the whole chicken, carrot, celery, bay leaf, parsley, peppercorns, and garlic in a large soup pot. Add enough water to cover the chicken. Bring the broth to a boil and then simmer for an hour, to an hour and a half, occasionally skimming off the foam. 2. Remove the chicken from the broth and strain the broth, tossing the veggies. Strain the broth again and set it aside. 3. Let the chicken cool, then shred the meat into a separate bowl or container and toss the carcass (or freeze it and use it to make chicken stock later). 4. Heat a few tablespoons of olive oil in large soup pot over medium-high heat. Add the onion, tomatoes, peppers and chile. Cook for about 5 minutes, until the vegetables have softened. 5. Pour in the broth and add the lime juice, cumin, cilantro, salt and pepper. Stir the mixture, bring it to a boil and then decrease the heat to medium-low. 6. Add the chicken and about 1/3 cup of tomatillo salsa. Give the soup a nice stir and simmer for about 20 – 30 minutes. 7. 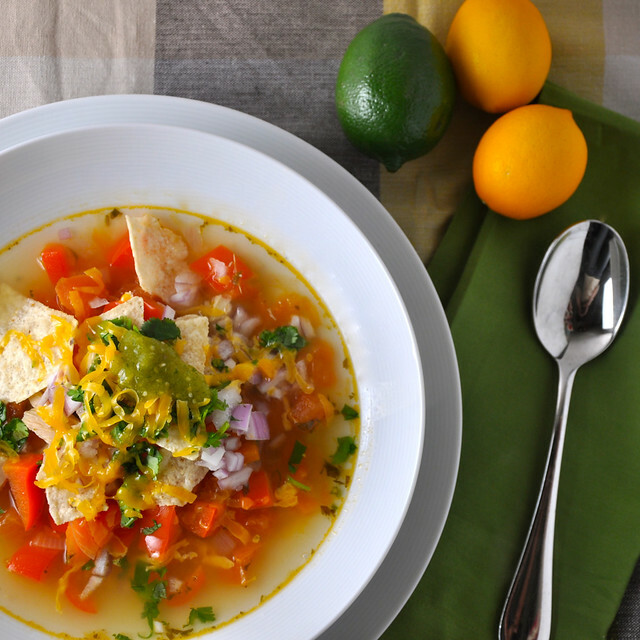 To serve, ladle the soup into bowls, top with tortilla chips, cheese, cilantro, red onion and more salsa, to taste. Season with salt and pepper and stir in more lime juice, as desired. 1. Put the tomatillos in a medium pot and cover them with water. Boil them for about 15 minutes. Drain and add them to a blender. 2. Next, toast the chiles in a dry skillet over medium-high heat until they’re slightly charred. Seed them and de-stem them, then add them to the blender. 3. Add the rest of the ingredients to the blender, along with 1/3 cup of water and blend until smooth. Refrigerate until ready to use.